So, Heather and I have come down with some sort of life-denying ague that makes us feel like crap, and in the interests of making sure we get our vitamins so our bodies can fight it off, I went out and got the makings for beef stew. It'd been several years since we made it, and as far as I can recall, I've never made it on my own, so it was kind of an adventure. I poked around on epicurious a bit, to get a sense of what made a good beef stew, and figured "hey! it's a stew" - it's not like anyone would be able to tell if I screwed it up. With that mindset, I was off to the grocery. Here's how things worked out. I poured about a quarter cup of olive oil into a 4 quart anodized / nonstick stock pot, and heated it until it was barely smoking. In the meantime, I finely chopped the garlic and shallots, then threw them into the oil. When they were looking pretty transparent, I threw in the beef with some salt and pepper and let the beef brown. While I was browning the beef, I coarse chopped the onion and celery. When the beef was brown on all sides, I took it out of the pot with some tongs and let it sit on a plate for a few minutes, and fried up the celery and onion. While that was cooking, I diced some potatoes (I had a few red fingerlings that I needed to use, and about four big red new potatoes) and two turnips. I tossed the turnips in first, then the potatoes, and added the first box of beef broth. I chopped up a box of mushrooms and threw those in, though I'd probably do those with the beef next time around, as they didn't absorb nearly as much flavor as I'd hoped. I cut up the beef into smaller pieces (about an inch square; some of the pieces were about three by three), and threw the meat back in, along with the cherry tomatoes (which I crushed), okra, green beans, broccoli, peas, carrots (chopped), and great northern beans. I added a can of Guinness somewhere in here as well. At this point, it was pretty clear that we needed a bigger pot, so we switched to an 8 quart pot. We added the other box of broth and simmered it for about an hour, stirring occasionally, and adding the can of diced tomatoes about halfway through for flavor. Salt and pepper to taste, et voila. 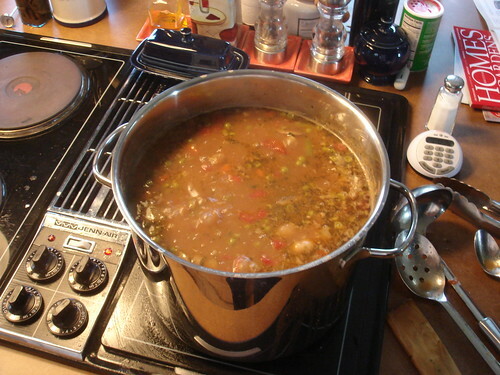 Some notes: the broccoli, okra, and great northerns basically disintegrated and thickened the stew; adjust amounts for a thicker or thinner stew. I'll probably add two cans of great northerns next time.